VALDOSTA, GA -- Parents of a south Georgia teenager found dead in a rolled-up gym mat must pay at least some attorney fees for people they accused of wrongdoing in a civil lawsuit that was later dropped, a judge has ruled. Classmates at Lowndes High School found 17-year-old Kendrick Johnson dead inside an upright mat propped against a gymnasium wall in January 2013. Sheriff's investigators concluded Johnson of Valdosta died in a freak accident, but his parents insisted he was killed. 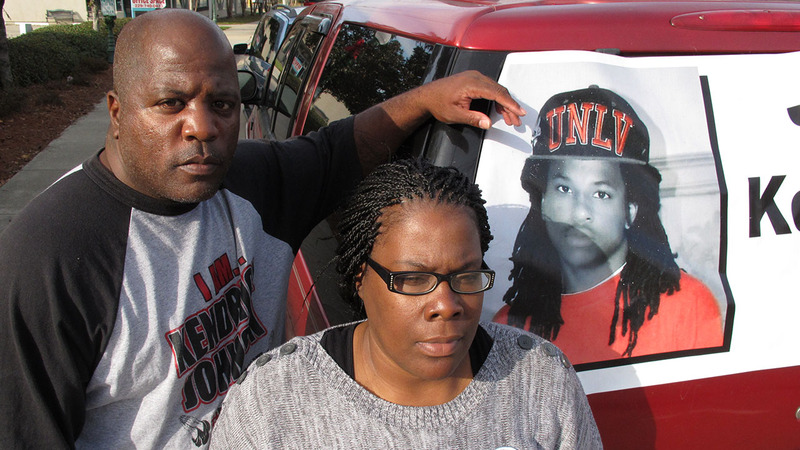 Kenneth and Jacqueline Johnson filed a wrongful death suit last year accusing two brothers of killing their son. They also claimed school officials and law enforcement helped cover up the crime. The Johnsons dropped their civil suit in March. Superior Court Judge Richard Porter granted requests Thursday from the defendants' lawyers to recoup attorney fees from the Johnsons, Georgia news organizations reported. The judge set a hearing for Monday to determine how much Johnson's parents would have to pay. Attorneys for the accused brothers, the Lowndes County sheriff and the school system have asked for more than $850,000. Chevene King, the Johnson family's attorney, did not immediately return a phone message Friday from The Associated Press. Johnson was last seen during the school day on Jan. 9, 2013. Security cameras showed him enter the gym, but did not record how he died. Classmates found his body the next day when they noticed his feet in the center of a rolled-up mat. Sheriff's investigators concluded he went head-first into the mat to retrieve a pair of gym shoes found beneath the body. An autopsy by a Georgia Bureau of Investigation medical examiner determined Johnson died from "positional asphyxia," meaning he got stuck upside down and was unable to breathe. Johnson's parents later had his body exhumed and paid a private medical examiner to conduct a second autopsy, which concluded he died from a blow to the neck. In June, the Justice Department closed a 2-year investigation into Johnson's death that provided no answers. The department issued a statement saying federal investigators "found insufficient evidence to support federal criminal charges," but it steered clear of saying whether its findings pointed to an accident or homicide as the cause of Johnson's death. The AP has not named the brothers accused by Johnson's parents because they were never charged with any crimes.